Somewhere between a beanbag and a platform sofa is pretty much our ideal seating option: the beanbag sofa. In many ways it is merely a big, curved pillow—an evolved pouf!—so you can sometimes find them in "teen" decor shops, meaning the prices are a little more manageable than those for standard sofas. 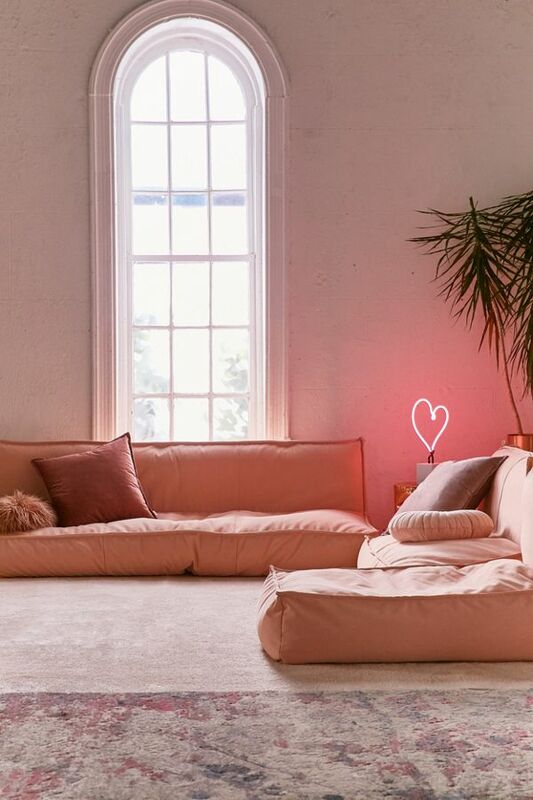 Before you worry that we're recommending you regress to dorm room decor entirely, note that beanbag sofas are in fact a mainstay of contemporary, elegant homes. Ligne Roset's Togo sofa, designed by Michael Ducaroy, falls squarely into this category: Most likely the grandfather of the whole trend, it first cropped up 40 years ago and still graces many a living room in spite of its sky-high price (this striped vintage sectional from the line will run you a mere $8K—and that's before you pay for shipping from France). The good news is that thanks to the design's success, you can now get beanbag sofas at much more appealing prices. At once slouchy and structured, the beanbag sofa, unlike an actual beanbag, is a pleasure to sit in for extended periods of time. One side is completely flush with the floor, without so much as a leg supporting it (just stretch yours out straight! ); the other stands straight up to support your TV-watching, book-reading, and sit-around-chatting habits. Depending on your style, you can select a more pillow-like or more sofa-like version. The key is that it's 100% squishy, all upholstery, and no hard bits. Maybe there are little pleated arms for resting your head or elbows, or some decorative tufting, or even a corner piece so you can use it as a sectional—but ultimately the beanbag sofa is just fabric encasing zillions of lightweight pellets. Just beware: If you have actual teenagers, they might never leave the living room.